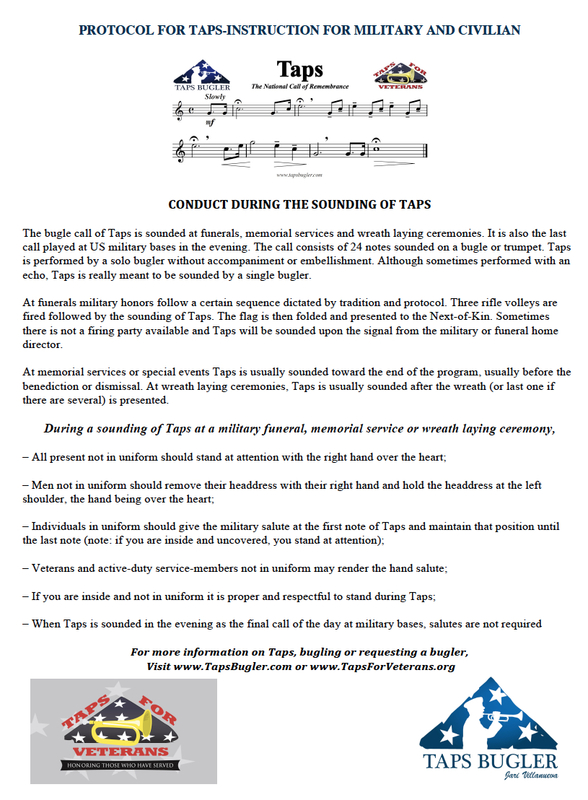 One question I get often is what to do when Taps is sounded. What exactly is the protocol? In a nutshell, it’s the same protocol as when you hear the national anthem. Taps is sounded at funerals, memorial services and wreath laying ceremonies. It is also the last call played at US military bases in the evening. Performance consists of 24 notes sounded on a bugle or trumpet. Taps is performed by a solo bugler without accompaniment or embellishment. Although sometimes performed with an echo, Taps is really meant to be sounded by a single bugler. 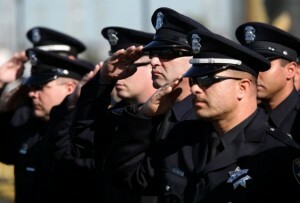 At funerals, military honors follow a certain sequence dictated by tradition and protocol. Three rifle volleys are fired, followed by the sounding of Taps. 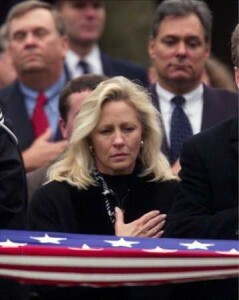 The flag is then folded and presented to the Next-of-Kin. Sometimes there is not a firing party available and Taps will be sounded upon the signal from the military or funeral home director. At memorial services or special events Taps is usually sounded toward the end of the program, usually before the benediction or dismissal. At wreath laying ceremonies, Taps is usually sounded after the wreath (or last one if there are several) is presented. – When Taps is sounded in the evening as the final call of the day at military bases, salutes are not required. This entry was posted on Friday, September 29th, 2017 at 12:00 pm	and is filed under Bugle Stories, Buglers Through History, Bugles for Performing and Collecting, General Interest, Getting Started on the Bugle, History of Taps, History of the Bugle. You can follow any responses to this entry through the RSS 2.0 feed. You can leave a response, or trackback from your own site. Conclusion of the ceremony? Thank u. Is it appropriate to play at the close of the ceremony? I heard it was protocol to turn out the lights on a military installment for the duration of the song. Is this true? I have recently been asked to play Taps at a non-military funeral. My instinct is that this is not appropriate. Am I correct? At the wreath laying ceremony at the tomb of the unknowen ( Arlington Natioanal ) Donald Trump held his right hand over his heart during the playing of ‘Taps’. Every 7-8 second he would bring his hand outward appro: 2 inches and then return his hand back to his chest. I counted 11 times that he did this What does this signify? Can anyone play Taps at a military funeral? Do they have to be military? Read that you can use someone from a school band or such.